Discover this hot tool for managing diseases and weeds in container nurseries and field production. The growth and quality of nursery plants are reduced when they must compete with weeds and diseases caused by soilborne plant pathogens. Soil fumigation — once a common practice for disinfesting soil — is no longer viable for most nurseries due to buffer restrictions, cost or environmental concerns. 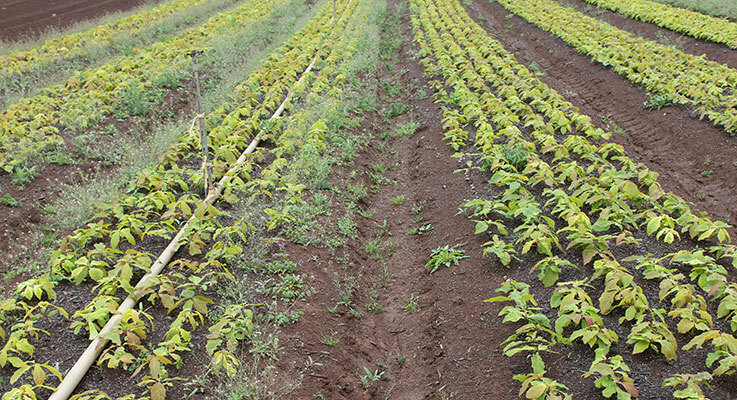 Herbicide options for controlling broadleaved weeds on field-grown nursery crops can be limited, and may result in the costly practice of hand weeding. Novel, sustainable strategies are needed to disinfest nursery soil of weeds and soilborne plant pathogens. Soil solarization has been used for decades to disinfest soil in “warm” climates. Solarization uses solar radiation to heat the soil under a clear plastic film. This lets the soil reach temperatures sufficient to kill certain soilborne pathogens and weed seeds. Many plant pathogens and weed seeds are sensitive to heat. Phytophthora, Pythium, Fusarium and Agrobacterium are commonly reduced by soil solarization. Common nursery weeds vulnerable to soil solarization include Canada thistle, common groundsel, lambquarters, redroot pigweed, shepherd’s purse and smartweed. Recent advances make it more feasible to solarize soil in “cooler” regions such as the Pacific Northwest, providing a useful tool for both container nurseries and field production. New types of plastic film turn up the heat. Previous work on soil solarization used standard polyethylene film. We found that newer types of horticultural film with an anti-condensation coating will attain much higher soil temperatures than the standard film. The coating prevents water droplets from accumulating on the underside of the plastic, allowing the plastic to remain clear and allowing greater penetration of solar radiation. Soil solarization in container yards reduces survival of Phytophthora species. In container nurseries, leafy debris from plants infested with Phytophthora can infiltrate the gravel and soil where spores can survive for months or years. When a new crop is placed on infested beds, Phytophthora can spread from the top few inches of soil and gravel to the healthy plants. We conducted field trials in which we buried pieces of infected rhododendron leaves at specific soil depths. Our research with P. ramorum in California, and with P. pini and P. chlamydospora in Oregon, shows that soil solarization with the anti-condensation plastic for as little as two weeks can kill Phytophthora spp. in the top six inches in container beds. The gravel layer actually helps heat the soil during solarization. In 2013 and 2014, we conducted 42 solarization trials in nursery sites ranging from southern California to northern Washington to develop a data set on soil temperatures measured at different depths with and without solarization. Temperatures in the solarized plots exceeded the threshold of 95 F for a minimum of 96 hours — conditions reported to kill P. ramorum — in 21 of 26 trials in 2013 and in all 16 of the 2014 trials. We are now linking this soil temperature data to ambient air temperature, solar radiation and day length from nearby meteorological stations to develop a predictive model. Collaborators at OSU’s Integrated Plant Protection Center are developing a user-friendly, web-based model that will allow growers to input their location and start date to determine the time required to kill Phytophthora with soil solarization. Weeds can be controlled in a tree seedling nursery. Some of the most dramatic and promising results with soil solarization were observed by production horticulturalist Sam Doane at J. Frank Schmidt and Son Co. in Boring, Oregon. In summer 2014, the nursery compared two types of plastic film — regular and anti-condensation — for solarization of their raised beds prior to fall seeding. Fallow ground was tilled and formed into 4-foot beds with 3-foot aisles, then covered, three beds at a time, with each type of plastic film. The non-solarized part of the field was not tilled or formed into beds until immediately before planting. When the plastic was removed in mid-September, there were virtually no weeds on the beds that had been solarized with the anti-condensation plastic, except for some in the aisles. In contrast, the beds solarized with the regular plastic had prolific growth of common purslane! Evidently the temperature under the regular plastic was warm enough to stimulate purslane seed germination, but not hot enough to kill the seed. After removing any weeds that had germinated, all beds were seeded in October. The following spring there were dramatic differences in weed emergence between solarized and non-solarized plots, although no obvious differences between the two types of plastic. Solarized beds had very few weeds, whereas non-solarized beds were loaded with weeds. For some species, trees in the solarized plots were also noticeably larger than in the non-solarized plots. To test solarization effects on pathogens, soil was collected from each of the plots before the start of the experiment, thoroughly mixed and placed into mesh “sachets” which were buried in the raised beds at 2- and 6-inch depths. Sachets were tested before and after solarization for counts of Pythium, Fusarium and Verticillium. Soil temperature and moisture sensors buried in the plots recorded data at 30-minute intervals. Plastic film was installed manually over pre-formed beds on July 15 and removed September 10. Maximum soil temperatures of 135–136 F were measured in the treatments with anti-condensation film, as compared to 124 in the regular film treatments or 107 in the non-solarized check. The cumulative hours above 95 F were compared for each treatment. The anti-condensation coating had a large effect on soil temperature, but film thickness did not. This was good news, since thinner film is cheaper, uses less plastic and is easier to recycle. Non-solarized beds were treated with glyphosate to kill weeds during the solarization period. The beds were seeded and mulched with sawdust in mid-September. By the end of October, there were obvious differences in fall weed emergence counts among the different treatments, with an average of 22.7 weeds per square foot in the non-solarized plots and less than 0.07 weeds per square foot in the best (hottest) treatment. In 2016, we will continue to monitor weeds, pathogens, mycorrhizal fungi, other soil microbes and plant growth to see the effects of soil solarization. Soil solarization does not kill all soil microbes. While most pathogens and weeds are killed by solarization, there are plenty of soil microbes that tolerate it. Graduate student Fumiaki Funahashi used next-generation DNA sequencing techniques to investigate the fungi and bacteria that are killed and which ones persist after soil solarization. In the study, mycorrhizal fungi and beneficial soil bacteria such as Bacillus and actinobacteria survived solarization. His approach could be used to predict which pathogens would be most susceptible to soil solarization. Timing is important. Solarization in the Pacific Northwest should be conducted during the summer months to coincide with the sunniest, warmest and longest days. In most years, this means starting in late June to mid-July and finishing 4–8 weeks later. Our studies show that during periods of hot, sunny weather, the time required to solarize soil could be as short as 2–4 weeks, but a conservative approach — longer is better — is probably safer. Additional research is planned to more accurately predict the required duration under Pacific Northwest conditions. Soil moisture is critical. Most weed seeds and soilborne pathogens can tolerate dry heat. For effective killing of weed seeds and soilborne pathogens, soil moisture is critical. If the soil is dry, it may be necessary to irrigate before covering soil with plastic film. A soil that is too moist cannot be worked with machinery. A soil moisture level needed for fumigation is a good starting point for solarization. Future looks sunny for soil solarization. Soil solarization will not solve every weed or soilborne disease problem, but it may be practical for some horticultural nurseries as a cost-effective way to reduce pesticide use and increase plant quality. Equipment for forming beds and laying the plastic film is commercially available for around $5,000, although not many distributors cater to Pacific Northwest growers yet. Several manufacturers produce plastic film, but some have minimum orders that exceed acreage needed by horticultural nurseries and long lead times that may require additional planning. Nevertheless, soil solarization provides an exciting new tool in the toolbox for managing weeds and pathogens in Pacific Northwest nurseries.